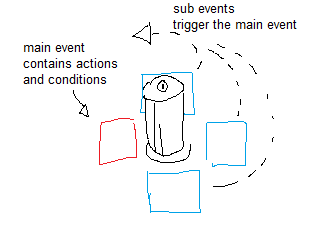 If you have a point/event in the game, on which you can't stand on, you simulate triggering it, by putting multiple events outside of it. The problem is: You have the events multiplied, they are an almost exact copy of one, except the coordinates. Now, I don't think that's a good way to solve the problem. Currently you put the coordinates of the events by hand into the condition. Instead, a method could be used. Now lets start with the ideas... and epic drawn, hopefully self-explenatory images. Inheriting stuff. I guess this one is clear to anyone who did object oriented programming before. 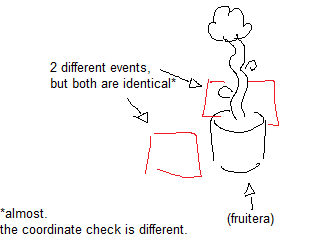 Instead of checking, if the position of the player is identical with the events position, the event could check, if the player is next to it. Logic-Nazi: "No! No! No! No! No! 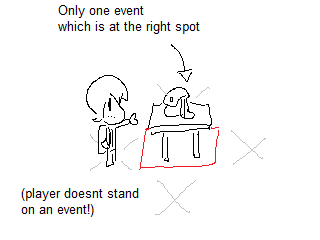 If the player is standing on the upper left corner, he can still trigger the event!!" Logic-Nazi: "This is not Python! You need more conentration!" Yeah, I know. But you get what I mean, right? If the player is standing next to it, the x OR the y coordinate is identical with the events x or y coordinate. Which means, subtracting those, will get you a 0. When on a corner though, x and y are both different from the targets x and y coordinate. Both subtractions will be unequal to 0.
so yeah... what do you guys think? D: I hope I explained my thoughts in a reasonable way. This is a fantastic explanation, thanks! I think that both of these ideas would be great to implement. Your second suggestion would definitely be the most elegant way to fix the current "Get Fruitera" event on the starting map. Right now a condition called "facing_npc" already exists, which basically checks to see if your character is right next to an NPC and facing them. It should be relatively easy for me to do the same for facing a tile instead. I'll make plans to add a "facing_tile" condition that will solve this problem. Happy to say I've implemented both of these new events in the latest development commit. You can now do both of these things. You can now use the call_event action to execute the actions from another event, ignoring its conditions. This is especially useful for creating events that can have CONDITION A OR CONDITION B be true.